It is clear to all; to fans, managers, club-mates, even the captain of England. 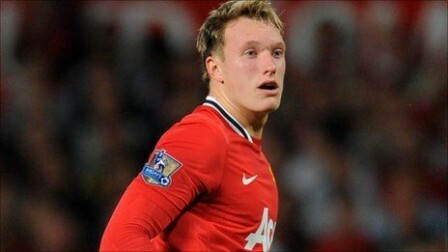 Anyone that has seen him play will admit, the boy Phil Jones, he is special. Without scoring a goal yet and barely having played 50 games, he has become one of the most talked about talents in world football. Usually the type of fanfare that Jones is receiving is reserved for mercurial talents; skilful wingers, classy playmakers, pacey goal-scorers. Yet here is a typically English footballer that is forcing his way into the first team of one of the very best club sides in the world on the back of less than a dozen games. Jones’ qualities lay mainly in his approach. He plays every second of a game as if it were the last minute of a cup final. Every challenge, every run, even every pass; he makes it as if the fate of the game depends on it. This is not to say that his only asset is his determination though. Jones is very physically gifted and can certainly play the game the way it should be played. In fact, such are his assets that the only problem with Jones is that no one yet knows his best position. At the moment it looks like this even includes such professors of the game as Sir Alex Ferguson and Fabio Capello. So far this season, at both club level and for his country, Jones has probably performed best at right-back. In the same way Steven Gerrard once occupied a fullback position early in his career, it seems it is just a way to get him in the side in a position where he can show all his attributes, if not yet making the consistent influence over 90 minutes that his talent could allow him to do. Simply put, he is too good to remain a right-back forever. The question remains then, what position will Jones go on to become great in? The two roles that fit his qualities are centre-back and central-midfield. Hardly anyone has ever gone on to master both roles, with perhaps only Marcel Desailly coming close. The majority of experts (people like Alan Hansen, Ugo Ehiogu, Sam Allardyce) say that Jones is best suited to fulfilling his potential at centre back. However, in the two biggest games of his career so far (for England against Liverpool at Anfield and for England against Spain at Wembley) he has started in central midfield. To look into which position he would best suit, his strengths and weaknesses must be broken down. However, even in midfield, Jones’ role would be primarily a defensive one. Therefore, his attributes for both positions will be very similar, making the weaknesses a more prominent factor. Looking at this very simplified break down of Jones’ attributes would show that he has more to offer in midfield, but less weaknesses in defence. The only real weakness at centre-back Jones has shown is his instinct of attacking every single ball and trying to win every tackle, along with the enthusiasm he has for taking the ball forward. This can sometimes mean he strays out of position, whilst for the very few times he misses/doesn’t win a challenge he can allow a cunning striker to slip in behind. Other than that recklessness which can creep into his game, Jones’ has all the ability to right now be capable of world class performances at centre-back. The over-eagerness will certainly wane as he gets older and wiser, which does make it all the more likely he will go on to play most of his games in future in defence. However, the defensive talents of Jones were clear in games for Blackburn previously. This year for Manchester United, what has impressed most has been the attacking talent he has shown. Jones has shown that not only can he use his power and dynamism to drive forward with the ball, but he has even shown he has good feet, able to ride and jink through tackles. On top of this, his ability to cover grass and his ball-winning abilities can not be questioned. His passing is a sticking point though. Jones is by no means a poor passer of the ball. He has already shown that he has enough speed of both thought and feet to play the quick tempo football that Manchester United demand. In defence he is definitely the type of defender you can rely on not to give the ball away, being as comfortable with the ball as he is. In midfield on the other hand, Jones can pass well but as of yet the ability to play that crucial ball or switch play consistently seems to be one of the very few merits that he may lack. In terms of goals, either creating or scoring, Jones does not really seem likely to do either in abundance. From right-back he has shown he can cross the ball as well as he can do most things, but with the ball in the middle of the pitch with limited options, he is more likely to keep it simple. As stated earlier, even in midfield Jones will be a defensive player. So a lack of goals or a cutting passing ability does not mean he can not play the position, especially at the age of just 19 (! ), meaning improvement is a certainty. The crutch though is that as Jones gets older he is guaranteed to lose the overzealousness that is his only weakness as a centre-back. Improving on his goal contribution and passing to become a great midfielder is possibly asking too much of Jones. Nonetheless, regardless of goals or through-balls, to have a player of his ilk in midfield is exactly what football lacks these days. Only Rino Gattuso remains of a generation which saw genuine defensive midfield greats; think Roy Keane, Patrick Viera, Edgar Davids along with others. These are the types of players that could tackle you fairly but still leave you limping for the rest of the game. They controlled midfield space like a crazy clamper in a tow-truck patrolling a no-park zone; you either move it or lose it. These are the only kinds of players that would be perfectly suited to stopping a team like Barcelona. Nowadays, looking at the improvement of Manchester United, or indeed any side in world football, means looking at how to beat Barcelona or Spain. They are the benchmark. The midfield of Xavi and Andre Iniesta is the soul of these great sides. Central-midfielders have the most influential role on a football pitch. How much influence on a entire game can a centre-back really have? Jones is in the best possible hands for a player that should turn into a world beater. Sir Alex Ferguson has helped countless amount of players become among the best in the world in their positions. Looking like a future captain of the next generation (both for club and country) it seems Jones has come through at the right time and with the right team. Whether he is in the right position yet though no one knows. What we do know though, is that wherever he plays, he will definitely be a central figure.